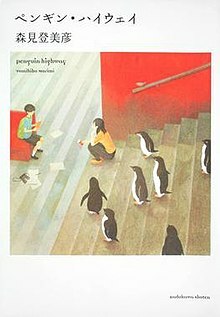 Penguin Highway (ペンギン・ハイウェイ, Pengin Haiwei, stylized penguin highway) is a Japanese science fiction novel written by Tomihiko Morimi, published in 2010. A manga adaptation began serialization in Media Factory's Monthly Comic Alive from March 27, 2018, and an anime film adaptation by Studio Colorido premiered in August 2018. Penguin Highway is a novel written by Tomihiko Morimi, where it was originally published by Kadokawa Bunko in tankōbon format on May 28, 2010 (ISBN 9784048740630). Kadokawa later republished the novel under the Kadokawa Bunko imprint on November 22, 2012 (ISBN 9784041005613). Upon the release of the film, Kadokawa republished the novel with a new cover illustration by Booota under the Kadokawa Tsubasa Bunko imprint on June 15, 2018 (ISBN 9784046317988). Yen Press announced at Anime Expo 2018 that they would be publishing the novel in English, with a hardcover release scheduled for April 23, 2019. A manga adaptation of the novel began serialization in the May 2018 issue of Media Factory's Monthly Comic Alive magazine, with illustrations by Keito Yano. The manga is published in tankōbon format, with the first volume being released on July 23, 2018. The film premiered at Fantasia International Film Festival in Montreal on July 29, 2018. Toho released the film theatrically in Japan on August 17, 2018. Fuji Creative is responsible for international distribution of the film. Anime Limited announced in July 2018 that they had acquired the film for distribution in the United Kingdom and Ireland, where it premiered at Scotland Loves Anime Glasgow on October 13, 2018, with a wider release in 2019. Eleven Arts announced that they would be distributing the film theatrically in North America, where it premiered at Crunchyroll Expo in San Jose on September 2, 2018, and a wider release on April 12, 2019. Madman Entertainment announced that they had acquired the film for distribution in Australia and New Zealand, where it premiered at Madman Anime Festival Melbourne on September 15, 2018, with a wider release premiering from November 8, 2018. The novel won the Nihon SF Taisho Award in 2010. The film won the Axis: The Satoshi Kon Award for Excellence in Animation award at Fantasia International Film Festival for the best animated feature. In Japan, the film premiered in 192 theatres in its opening weekend, where it placed in 10th position. The film later exited the top 10, having earned a total of ¥307 million (US$2.76 million) as of August 26, 2018. ^ a b c "Dai-31-kai SF Taishō Jushō-saku" 第３１回ＳＦ大賞受賞作 [31st SF Taisho Winning Work]. Retrieved November 14, 2018. ^ a b c d "Tatami Galaxy Novelist's Penguin Highway Coming-of-Age Fantasy Gets Anime Film". Anime News Network. March 1, 2018. Retrieved November 14, 2018. ^ a b c d e Ressler, Karen (June 26, 2018). "Penguin Highway Anime Film's 2nd Trailer Reveals More Cast". Anime News Network. Retrieved November 14, 2018. ^ "Pengin Haiwei" ペンギン・ハイウェイ [Penguin Highway] (in Japanese). Kadokawa Shoten. Retrieved November 14, 2018. ^ "Kadokawa Bunko Pengin Haiwei" 角川文庫 ペンギン・ハイウェイ [Kadokawa Bunko Penguin Highway] (in Japanese). Retrieved November 14, 2018. ^ "Kadokawa Tsubasa Bunko Pengin Haiwei" 角川つばさ文庫 ペンギン・ハイウェイ [Kadokawa Tsubasa Bunko Penguin Highway] (in Japanese). Retrieved November 15, 2018. ^ Ressler, Karen (July 8, 2018). "Yen Press Licenses Happy Sugar Life, Kakegurui Twins Manga, Penguin Highway, Walk on Girl, Mirai Novels". Anime News Network. Retrieved July 10, 2018. ^ "Penguin Highway". Yen Press. Retrieved April 14, 2019. ^ "Komikku Araibu 2018-nen 5-gatsu-gō" コミックアライブ 2018年5月号 [Comic Alive May 2018 Issue]. Monthly Comic Alive (in Japanese). Media Factory. Retrieved November 14, 2018. ^ "Penguin Highway 01" [ペンギン・ハイウェイ　01] (in Japanese). Monthly Comic Alive. Retrieved November 14, 2018. ^ a b "Hikaru Utada Performs Penguin Highway Anime Film's Theme Song". Anime News Network. November 14, 2018. Retrieved June 30, 2018. ^ a b Antonio Pineda, Rafael (July 26, 2018). "Penguin Highway Film Wins Satoshi Kon Award at Fantasia Int'l Film Festival". Anime News Network. Retrieved November 14, 2018. ^ a b Hanley, Andy. "Anime Limited acquires Penguin Highway". All the Anime. Anime Limited. Retrieved 10 July 2018. ^ Scotland Loves Anime [@lovesanimation] (August 29, 2018). "We can't reveal the full lineup yet but tickets for select films in our lineup at @glasgowfilm (12-14th Oct) are on sale: bit.ly/SLA2018Glasgow Includes: Penguin Highway (EU Premiere) Fate/stay Night: Heaven's Feel Movie 1 (UK Premiere) Even a screening of Cyber City Oedo 808" (Tweet) – via Twitter. ^ Antonio Pineda, Rafael (August 31, 2018). "Eleven Arts to Premiere Penguin Highway Anime Film at Crunchyroll Expo". Anime News Network. Retrieved September 1, 2018. ^ Antonio Pineda, Rafael (February 6, 2019). "Eleven Arts to Screen Penguin Highway Film in U.S. Theaters in Winter 2019". Retrieved March 26, 2019. ^ Sarto, Dan (September 3, 2018). "'Penguin Highway' Theatrical Release Set for April 12". Retrieved November 14, 2018. ^ Madman Anime Festival [@MadFest] (August 22, 2018). "Be swept up in a whimsical and wondrous journey at @MadFest Melbourne 2018 with the Australian Premiere of Penguin Highway! 🐧✨ mad.mn/penghighway" (Tweet). Retrieved August 22, 2018 – via Twitter. ^ Penguin Highway Official Theatrical Trailer (YouTube video). Madman Entertainment. October 10, 2018. ^ Antonio Pineda, Rafael (August 20, 2018). "Live-Action Gintama 2 Earns 800 Million Yen at #1, Seven Deadly Sins Opens at #5". Anime News Network. Retrieved November 14, 2018. ^ Antonio Pineda, Rafael (August 27, 2018). "Live-Action Gintama 2 Film Falls to #2, Seven Deadly Sins Falls to #10". Anime News Network. Retrieved November 14, 2018.